Microsoft have released their beta version of App-V for Servers. It is currently available as part of their SCVMM (System Center Virtual Machine Manager) 2010 beta release. It is also due to be released with the latest version of Windows Azure. Although this technology is to be initially bundled with these two products the technology will not be limited to these two products and can work just as well on its own. Hopefully this post will help you to understand the concept of App-V for Servers and to provide you with a fairly detailed walk-through in creating your own App-V for Server sequences. The current desktop model of App-V relies on users launching their applications through the use of shortcuts, FTAs (file type associations) or DSC (dynamic suite composition) links. The application is then streamed to the user from the App-V Management server or App-V Streaming Server. This model does not translate very well to server applications. Server applications are not launched by individual users, they are associated to servers and the applications need to respond in a timely manner to client requests. App-V for Servers intends to address the needs of server applications and is designed to speed up, standardize and stabilize the provisioning of new servers within your datacenter. App-V for Servers not only separates the application from the OS but also from the configuration. Applications are no longer streamed. Instead, applications are copied, loaded into the App-V cache and registered with the App-V Agent (equivalent to the App-V client in the desktop model) using new Powershell cmdlets. This removes the requirement for a dedicated management server. As most new server management tools such as Azure and SCVMM are all powered by Powershell, it is easy to see how they could take advantage of App-V for Servers. Due to the fact that the application is no longer streamed, support for feature block 1 has also been dropped. Although files continue to be contained within their protective ‘bubbles’, the new App-V Agent creates ‘special’ shortcuts within the mount drive that ‘open’ the ‘bubble’ to allow you to view and modify the contents. In essence, it seamlessly appears to an administrator that they are directly opening files from the mount drive. sva_cmdlets.msi – Installs the Powershell cmdlets that manage your virtual applications. 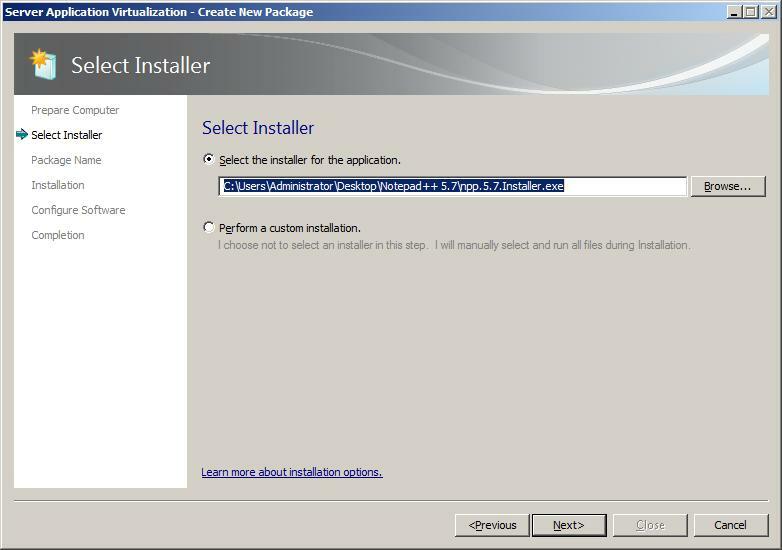 These are separate from the Agent installation to allow them to be installed on a desktop PC for remote management purposes. You are now given the chance to launch the applications for the first time, this allows you to capture any first launch configuration items such as license agreements. A new page has been added that allows you to create a default deployment configuration file. Once your application has been saved an XML file will be generated within your sequence folder called deploymentconfig.xml. This file can be used to deploy XML, INI or registry settings along with your virtual application allowing you to customize your sequence to various server types. The file can also contain scripts similar to those found in OSD files but these are run at deployment time rather than application launch or shutdown. The files view now has a new folder structure called appv_subsystem_settings, this folder will contain the integration with subsystems such as IIS.